I’m really not one to boast, but I honestly could not be anymore proud of myself at the moment. 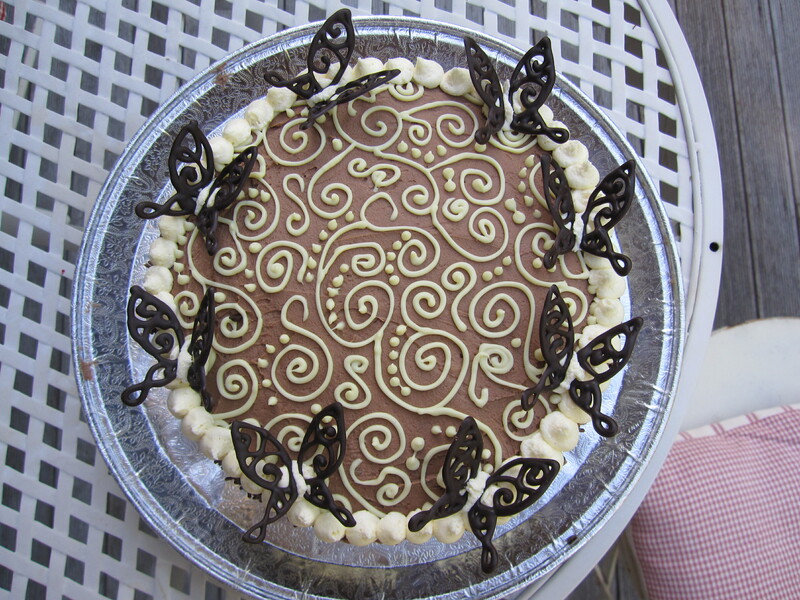 Totally 100% my own design, baked from scratch by hand, and lovingly decorated. 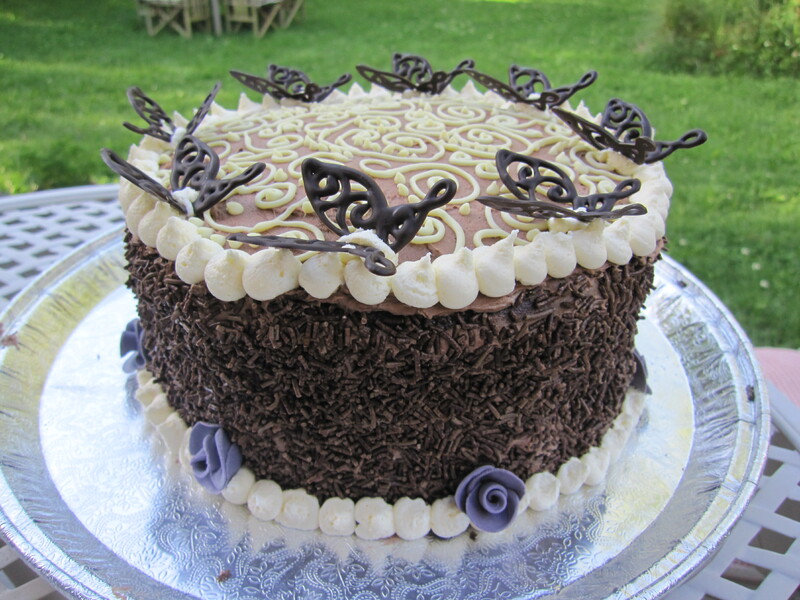 Three layers of devil’s food cake, sandwiched together with chocolate mock cream, coated in chocolate butter icing, dipped in chocolate hail, adorned with white chocolate flourishes, purple royal icing roses, chocolate butterflies, and further vanilla butter icing. After a total of about seven hours work, 7 cups of icing sugar and 400grams of butter later – it was devoured in about 15 mins. And did I mention – the taste was the closest I have ever been to heaven. If there is one thing you could judge by it’s looks, I think this cake would be the suitable candidate. It was a perfect way to conteract the long-term effects of studying. Here in New Zealand, we have our end of year exams at the moment, and study leave is not doing my head too well. However, I used this cake as an excuse to get away from my science books and for letting off a bit of creative steam – okay, a lot of creative steam. 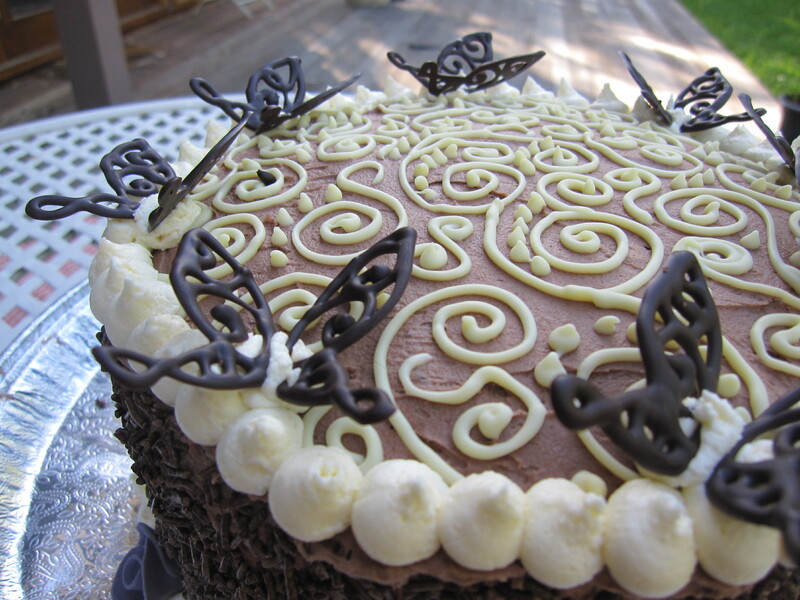 I used the method of alternating, 1 hour of study, meant half an hour spent on the cake. But this quickly turned into 30 minutes of study, and a whole two ours on the cake. It was pretty challenging to have to sit and study while three freshly baked chocolate cakes sat on the bench in front of me. I baked the cakes on Thursday and decorated on Friday. For someone who is used to the whole ‘bake and eat’ process, having to leave fresh baking alone was quite tough I must say. I made the beauty (and yes, I think we can call it ‘the beauty’) for one of mum’s work friends wife’s 40th birthday and also to cellebrate the end of year Christmas party for her work. It deffinatly collected quite a few ‘ooo’s’ and ‘ahh’s’, as well as some astounded looks. It is most deffinatly my best baking creation yet. It was the perfect way to end the evening, and like I said before, I’m not even kidding it was like eating a piece of heaven. And as for science, it didn’t loose out. I sat my exam today and it was a breeze – turns out studying isn’t always the way to go for a baker.